Our spring snow goose hunts take place in major migration corridors. Untold numbers of flocks that migrate through these areas providing great decoying action. We are currently taking booking for 2019 Saskatchewan duck hunts. The zones we are licensed to guide in hold large numbers of Snow Geese, Canada Geese, Specklebellies (Whitefronted) Geese, Mallard Ducks, and Sandhill Cranes. 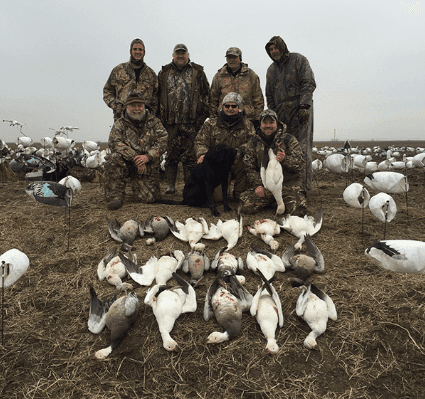 If you are looking for a late winter or early spring hunting adventure we offer spring snow goose hunts with some of the finest action in the Midwest. Since 2001, we have established a long track record of running very successful snow goose hunting. Up North Outdoors, Inc. employs a staff of highly skilled spring snow goose guides that hunt over large spreads of the best snow goose decoys and equipment to ensure that you have a quality spring snow goose hunt when you book with us. Our waterfowl hunts are run in multiple locations as we follow the snow geese on their northbound migration. We start hunting near the end of January in Arkansas where large numbers of snow geese have spent the winter months. As the spring migration gets underway snow geese that wintered farther south begin moving up from the Gulf Coast States and Mexico. After most of the snow geese have migrated north we leave Arkansas moving north to run our Iowa snow goose hunts. From late February through mid March you will find us on the western side of Iowa hunting snow geese. This area in Iowa has some staged birds but more importantly is a migration corridor. We catch a lot migrators moving from Squaw Creek National Wildlife Refuge (recently renamed Loess Bluffs National Wildlife Refuge) as they leave the refuge heading for South Dakota. There is a consistent churning of the flocks as new birds migrate in from the south and staged snow geese migrate farther north. During the fall of the year you will finds us on the beautiful prairies of Saskatchewan starting 2019. We are licensed in 4 zones in the SW portion of the province. Large numbers of Canada Geese, Specks, Snow Geese, Sandhill Cranes, Mallards, and Pintail inhabit our zones. The best Saskatchewan duck hunting occurs from late September through early November. Spring Snow Goose Hunts & Licensed Saskatchewan Outfitter. Offering hunts for Snows, Speckbelly, and Canada Geese, Sandhill Cranes & Mallards. The USFWS is allowing the duck season to last until Jan 31 under a new bill signed by President Trump. The spring season will open Feb 1 (Saturday). That means we will not be able to hunt Mon-Fri (Jan 27-31) first 5 days of season hunt this year. The 5-day hunt will be changed to Feb 3-7. Also, the youth duck season moves from the first Saturday in February (Feb 1) to the second weekend (Feb 8) under the new proposal. This is only the first reading, not set dates yet but typically the proposed season is the same as the finalized season. This will require some of you to change the dates you have booked for your Arkansas 2020 hunt. We will be in contact with those of you that are affected by the change. Today we saw more honkers than snows migrating north. There were also a few Speck and Sandhill Cranes. High field shot 13 white geese. One snow and 12 ross geese. Tomorrow looks like we have some rain in the forecast. Thousands upon thousands of birds where over the decoy spreads. There was a big push north. This morning they didn't pay us very much attention. This afternoon there was a few that cooperated. We are starting to see some Ross geese. Copyright © 2019 - Up North Outdoors, Inc. All Rights Reserved. | Powered by Iroc Web Design Services.